Dynamic Programming and Its Applications provides information pertinent to the theory and application of dynamic programming. 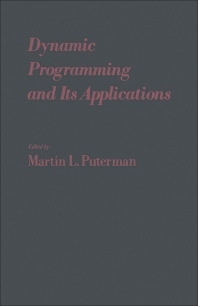 This book presents the development and future directions for dynamic programming. Organized into four parts encompassing 23 chapters, this book begins with an overview of recurrence conditions for countable state Markov decision problems, which ensure that the optimal average reward exists and satisfies the functional equation of dynamic programming. This text then provides an extensive analysis of the theory of successive approximation for Markov decision problems. Other chapters consider the computational methods for deterministic, finite horizon problems, and present a unified and insightful presentation of several foundational questions. This book discusses as well the relationship between policy iteration and Newton's method. The final chapter deals with the main factors severely limiting the application of dynamic programming in practice. This book is a valuable resource for growth theorists, economists, biologists, mathematicians, and applied management scientists. Comments Of Arthur F. Veinott, Jr.